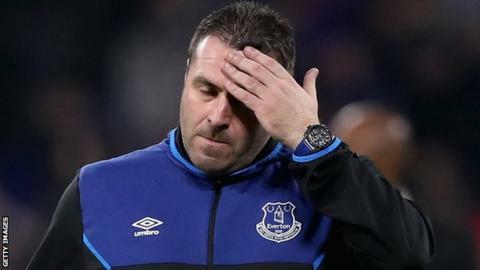 Everton's 5-1 Europa League loss to Atalanta leaves "a bad taste in the mouth" of their supporters, says caretaker manager David Unsworth. Just 17,431 turned up at Goodison Park to watch the Blues suffer a humiliating defeat in the final home group game of this season's failed European campaign. It leaves them bottom of Group E with just one point from five games. "When you put on the shirt you have to play with pride and effort and they didn't do that," Unsworth said. Speaking to BT Sport, he added: "It was a dead rubber but I spoke before the game and said our fans had paid good money to come and see this. They leave with a bad taste in their mouth and so do I." Unsworth, who also branded Thursday's result and performance "unacceptable", made a number of changes for the game, including bringing in 19-year-old midfielder Beni Baningime, who he felt was his side's best player. He has now overseen four losses in his six games in charge since succeeding Ronald Koeman on a temporary basis, during which they have conceded 16 goals. "I know there wasn't anything riding on the game, but we had paying Evertonians tonight and I stressed we had to compete - the manner we capitulated just isn't acceptable and the players know that," he continued. "What you can't do at this level is carry players. When you're best player is a kid who's only had a couple of first-team appearances, that tells you all you need to know. "Players need to take responsibility - senior players, foreign players, young players." The Toffees are at Southampton in the Premier League on Sunday, having taken four points from their past two domestic games to move out of the relegation zone into 16th. Unsworth added: "I asked the players to make it difficult for me to leave them out of the team on Sunday, but the majority have made it very easy." Two goals apiece from Bryan Cristante and Andreas Cornelius, and one from Robin Gosens, condemned them to defeat on Thursday. It could have been worse had Joel Robles not saved a penalty, or Sandro Ramirez scored a goal that briefly narrowed the deficit to 2-1. However, despite Thursday's result, Everton captain Wayne Rooney said Unsworth has had a "positive" impact on the Everton team since taking charge. "Since David Unsworth has come in there's been a great atmosphere among the players and some positive results," said the 32-year-old, who was recalled to play up front against the Italian side. "We all have to play a role, obviously there's been a change of manager. It's been a positive change in terms of performances, tonight aside. "We have to keep trying to pick up points in the Premier League and move up the table." The Toffees have had an approach for Watford boss Marco Silva rejected. "The board have a decision to make and I'm sure they're working on it," added Rooney.